Ok - so last night I went to my sleep study. It was pretty much how I imagined it would be. I got there around 8:30 and the receptionist (of course) had NO information on me...but considering that it was only JUST set up yesterday, it's no surprise - but it was fine - they registered me and showed me to my room. So around 11 we shut off the lights and I was woken up at 5:45. She asked me how long I think it took me to fall asleep and honestly I'd say maybe about 30 minutes or so. The problem isn't FALLING asleep - it's STAYING asleep...but I also told her that I woke up at LEAST 4 times during the night (which is the issue at hand) with all the tossing and turning I did. She also asked if it was better, worse or the same quality of sleep than I get at home - and honestly it was about the same. So I'm really hoping that last night's sleep was my "normal" which I think it was - but obviously when you've got 20 million wires on you and you're trying to BE conscious OF your sleep - it's not exactly the same as being at home on a normal every day night. lol. I'm very excited though to find out the results (obviously) and I should also have all my blood work back here shortly from my doc concerning the possible anemia. I know it may sound like I'm HAPPY to find out that I'm anemic or that I have restless leg...believe me - it's not like that at all - it's more the fact that something has been wrong with me for SO long and I've FINALLY made the decision to have these things looked at instead of just "dealing" with them and thinking it's completely normal to have these issues...I think, too, a lot of why I never looked into these issues before is that I've never really thought that I HAD anything wrong with me. Only hypochondriacs have their issues looked at - but not me - "eh whatever" sort of attitude...but it's seriously just gotten to the point where I can NOT sleep. So yeah! we shall see! When do you get them?? The results?? I wonder if they are conclusive...I hope you get some answers. If I am busy and miss your post- if you don't see a comment for a couple of days after you post it- hop over and tell me you posted them because I am very interested, and relate to a lot of what you are going through. I hope you find some peace! I too (obviously) hope I get some answers! I think it's just so frustrating because I've never thought of it truly AS a problem - and always just thought "eh - it's something I deal with"...but now it's soooo cool to actually think i don't HAVE to live this way! I'm a 34 year old woman and live with with my husband, our Golden Retriever, Pug and Calico cat. I love books, bikes and canning! This was me at my heaviest (2003) and at my lightest (2004) - I WILL weigh 160 again! 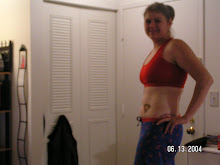 Here is a pic of me at my lowest - around 160 in 2004 - I WILL get back there! My low-carb and gluten-free almond cookies video just hit 10,000 views on YouTube! Let's see that weight go down!! Wk04: Sat 31/Jan/09 - 188 lbs! Wk05 - 08 Feb not weighing in! The blogs listed below are "Some NON-LOW-CARB Recipe Blogs"...I have these here on my site as they are absolutely beautiful blogs and would be a great starter as ideas for recipes that might possibly be able to be made Low-Carb.